To process orders on the POS App, you will basically select items via the app to create an order and then use the App to further complete and process the order in person. We'll cover this whole process in a moment, but first we need to get your products to the App. After your initial connection to the store, the POS App will simply import the Store's name information. 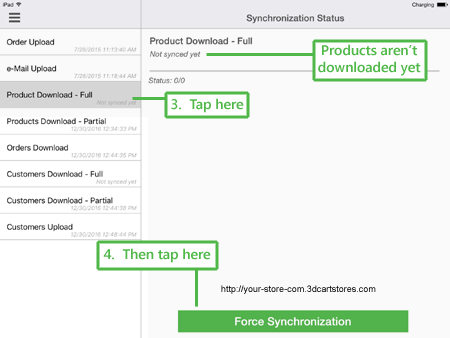 To get your store's products into the App, we'll need to synchronize the App to the store. Next, tap on the "Sync Status" option. 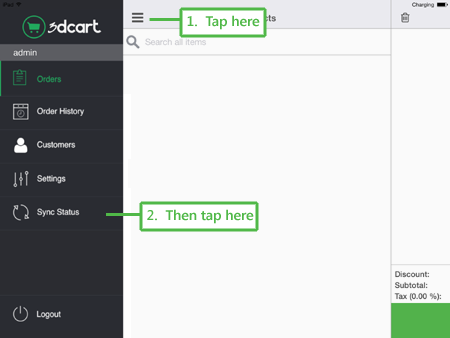 When receipts are emailed, they are not sent from your iPad device, but rather from the 3dcart store. This Synchronization option will take new receipts from the POS App and sychronize them to your store for the actual sending. This option will import all of your products from your store and insert them into the POS App. This option will import only your products which have been updated since the last full synchronization. This option will synchronize previously uploaded POS orders from your Online Store back into the POS app for re-orders and follow ups as needed. 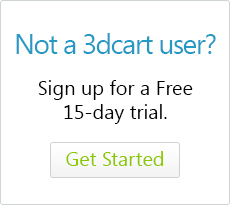 This option will let you download your entire customer base from the 3dcart Online Store so that you can select them as customers from the POS app. This option will import only your customers which have been added on the online store since the last full synchronization. As you create orders on the POS app, you can also create new customer records on the POS app. This option will allow you to synchronize those customer records back to your online store. Each of the above options will synchronize at regular intervals. However, you can also use the "Force Synchronization" button at the bottom left of each section to manually initiate a synch as needed. We'll go over each of these in more detail, but for now, we'll concentrate on getting products from your 3dcart store over to the POS App. Tap "Force Synchronization" to begin the transfer. Depending on how large your store is, this process may take some time. Also, be aware that you may need to refresh the orders view to see your newly downloaded products in the app.